Soul Gems are miscellaneous items which can be used to trap the souls of dying creatures or NPCs. The resulting filled soul gems can be used as power sources for enchanted items, either when initially creating custom enchanted items or when recharging depleted enchanted weapons. Note only Black Soul Gems and the Black Star can be used to capture the soul of an NPC, which is always a Grand Soul. There are also Soul Gem Fragments found in the game. 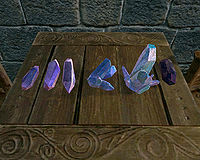 These are classified as minor loot and are not actual Soul Gems. Lesser Soul Gem none 0002e4e4 0.2 25 500 (Lesser) 750 Second smallest size of soul gems. Greater Soul Gem none 0002e4f4 0.4 100 2000 (Greater) 2250 Second largest size of soul gems. The Black Star none 00063b29 0 1000 3000 (Grand) 6200 (caps at 3000) Can be used to capture an NPC's soul, and will not break on use. press "The 'wait' button, which is T by default"
The Rare Curios Creation adds Flawed Varla Stones, which function identically to a filled common soul gem. Manually filled gems do not increase their value (with the exception of black and grand soul gems filled with grand level souls).